Western music refers to all music born in the Western world, including Europe. Records of this music exist that date back well over 1,000 years. Although genres, styles and language have changed through the centuries, the five main elements contained within comprise the foundation of Western music as we know it. When you thinks of the term Western music, you probably think of a number of characteristics without knowing it. For instance, instrumentation alone often differentiates Western music from the music of other cultures. In addition, when juxtaposed with Eastern music, Western music is often said to be complex in a dense, harmonic, vertical fashion. The standard Western tuning system, called equal temperament, also differentiates Western music from the typical quarter-tone and melodically complex music of Eastern cultures. Several Eastern/Asian scales contain only five notes, whereas the typical Western scale contains seven or more notes, altering musical possibilities. Melody, in simple terms, is the perceptible tune of a piece of music. It stands out above the rest of the music and is the part you're most likely to hum. 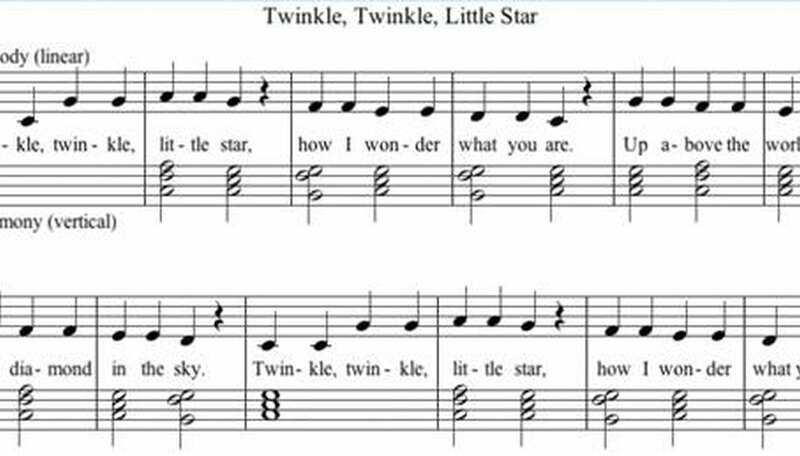 For example, take a tune with lyrics, like "Twinkle, Twinkle, Little Star." The words you sing contain the melody. Melodies are derived from scales, or ordered sets of pitches from low to high or high to low. Melodies derived from Western scales, most commonly the major or minor scales, are the most identifiable element of Western music. Harmony in music refers to when two or more notes sound simultaneously. Whereas melody is a single line and is a linear element, harmony is perceived more as a vertical element of music. The harmony, just like the melody, is usually derived from some kind of scale, again, most commonly the major or minor. In most Western music, the harmony serves an accompaniment role to the melody, usually in the form of chords. Chords occur in music when three or more notes sound simultaneously. The harmony in music plays a foundational role to the melody, thus giving the melody deeper meaning. 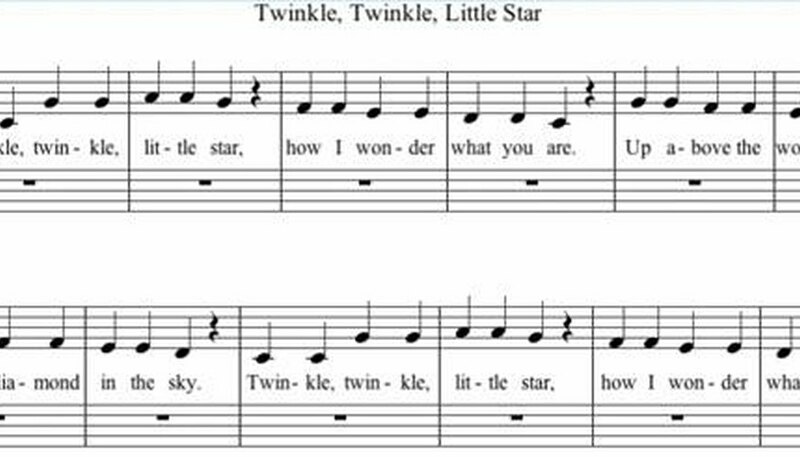 Take a look at the harmonic accompaniment to "Twinkle, Twinkle, Little Star" in the demonstrated image. Rhythms are the specific patterns of short and long durations given to the melody and harmony. Rhythm accounts for much of the "feel" of a piece of music. Rhythms are established by a regular pulse in the music, also called the beat. These pulses, or beats, can occur at any speed, as long as they are equal in duration. The most common division of rhythm in Western music is the quarter note (a solid dot with a stem). The squiggly line in place of the note is called a rest, where the performer is silent for a specific duration, equal to a corresponding note value. (In this example, the quarter rest's duration corresponds to the quarter note.) These quarter note (among other) beat patterns are organized into meter, or a regular pattern of stressed and unstressed beats. In this case, the meter is 4/4, seen at the beginning of the example. 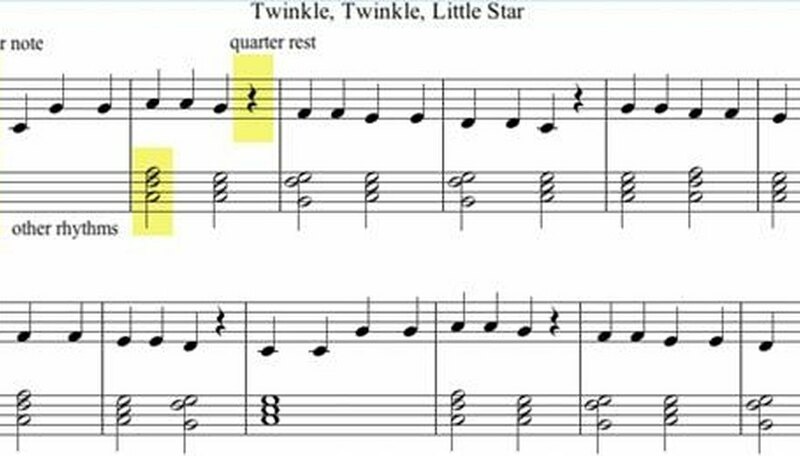 Look at the rhythm of the melody of "Twinkle, Twinkle, Little Star" in the demonstrated image; the rhythms are all beat notes because each note/rest is equal in duration. In this case, the beat note is a quarter note. Timbre in music refers to the sound color, or texture or characteristics of the sound. Identifying timbre involves taking into account all the instruments sounding at one time. You may be listening to a rock band, a jazz big band, an orchestra or a solo piano piece. The timbre in all of these situations would differ greatly due to the instrumentation. All instruments have acoustic properties that make them identifiable. For instance, you can probably easily identify the sound of a guitar, piano and snare drum if you hear them. Each instrument has its own unique timbre, just as each ensemble has its own timbre. Form is the organization of all the individual sections of a piece of music. Form is based on sections of music that repeat and sections of music that are contrasting. There are a few basic kinds of form, and these forms are notated with letters above the music in the score. For instance, binary form is a two-part form notated with the letters A-B. The A section contains specific music, and the B section contains contrasting music. Both parts will most likely have repetition within themselves, making them identifiable as a standalone section. Ternary form is a three-part form, consisting of either an A-B-A or an A-B-C form. The A-B-A form has an entire section of music repeat, where the A-B-C form has three distinct independent sections of music, with no return of previous material. 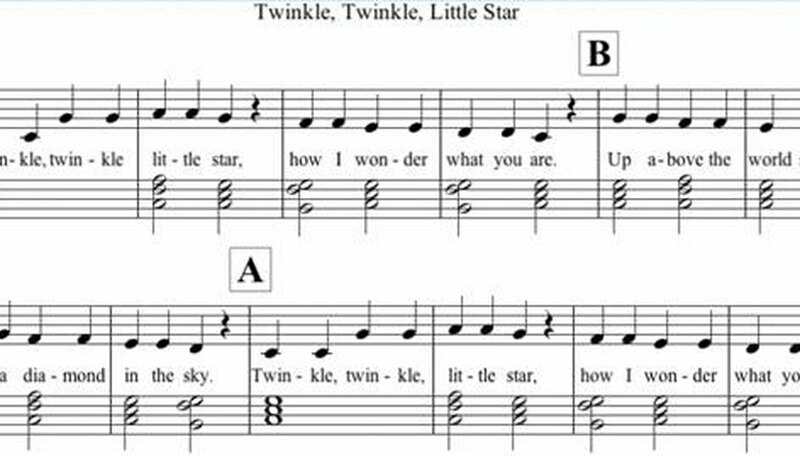 Take a look once again at "Twinkle, Twinkle, Little Star" (in the image) to see the A-B-A ternary form. Another common form is called a variation form, the most well known probably being Pachelbel's "Canon in D." This occurs when there is a common thread between all the music, some underlying passage or perhaps a repeated figure by which all the music is structurally the same, but other elements change, such as melody and rhythm. Scott Blanchard has published numerous online articles in music theory through the premier music education website, WorkshopLive.com. He holds an Master of Music from Bowling Green State University, and is an adjunct professor of music at Westfield State College. Currently, he is a proofreader for National Guitar Workshop Publications, distributed through Alfred Publishing.